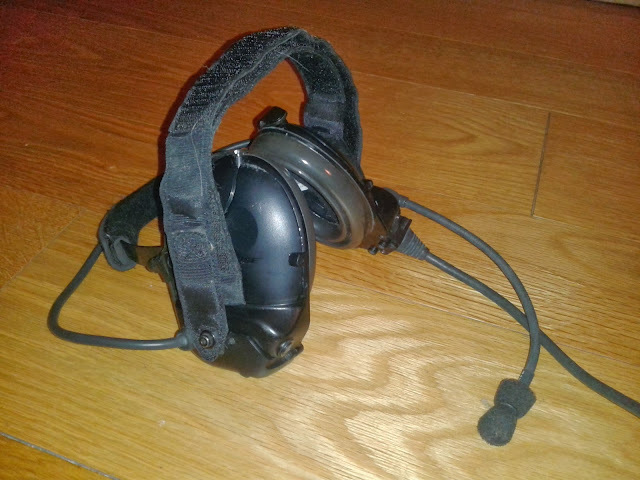 "Why should I buy the Bose QuietComfort 15 (QC15) when I can find at Army surplus or online the rugged Bose Triport Tactical headset ? ... especially when Bose claims it uses the same technology in both". This is how it all started. It even became obvious that I needed both, one for home and one for outdoors activities. If you're unsure about the differences between these two, I suggest you read my other post explaining why they're completely different things. Checked all the wires with a multimeter. This is the first thing to do: you unplug wires on both sides and check for broken ones. All connectors were glued with transparent silicone (which is easy to remove): it did not work. Opened the headphones and the control box to look for burned components (visual inspection): no luck neither. Cross checked the noise cancelling circuits and speakers by plugging the left ear cup noise cancelling circuit on the right ear cup speaker and ... bingo ! The right earcup speaker was not working with the left earcup circuit, simply meaning it was not working. First, unscrew the mic (or the plastic cover, if you're working on the other side) and disconnect the cable going to the battery compartment. You then need to remove the three screws on the other side of the ear cup. This will give you access to the noise cancelling circuit. From there, you will need to remove the silicone glued to the connectors to detach them. You can then disconnect all connectors (except maybe the for the cable going to the other ear cup). 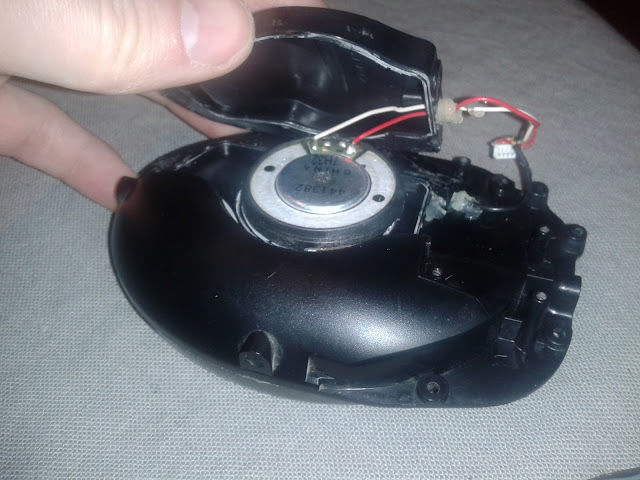 You now need to remove the noise cancelling circuit before opening the ear cup and replacing the speaker. 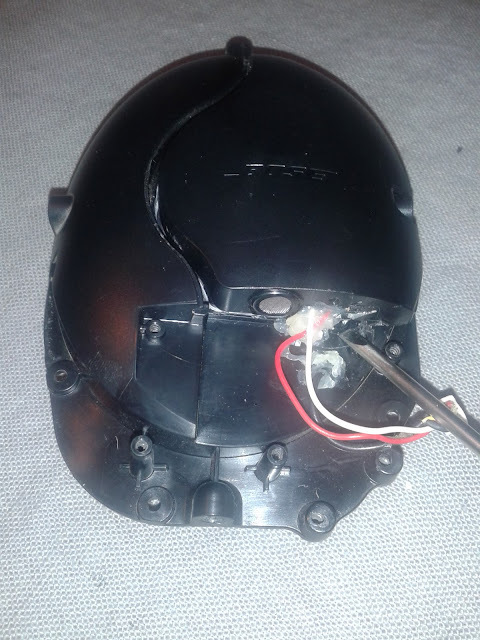 Detaching the speaker from the metal frame of the headset is esay. You need to slightly bend the metal (don't worry, it will keep its shape). 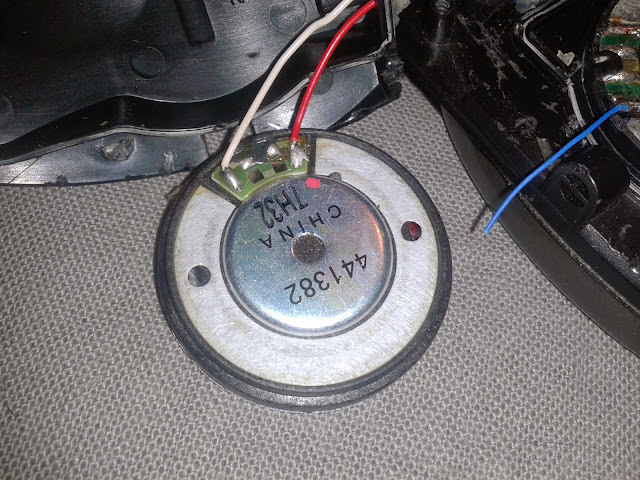 Unfortunately the (defective) speaker is trapped inside a glued encasing and it is not meant to be serviced. You can however break it open, and if you do, I recommend you to use a small flat screwdriver (see picture on the right) to force it open. Note: you will need to use a lot of force to break the glued plastic. Starting from the lower right corner is the best place to start as you will make a dent there and this place is hidden behind the noise cancelling circuit. Once open, you will need to remove the broken speaker (which is also glued to the plastic casing. If you're going to replace the speaker of a noise cancelling headphone, there is one single thing you should not get wrong: noise cancelling works by playing the opposite (negative) sound wave in the earcup to cancel the noise. Although I have not tried it but I suppose if you connect it wrong it should double the noise instead of cancelling it. Once you removed the old speaker, and soldered the wires to the new one (polarity ! ), make sure you glue the new one properly. You actually need to make sure the glue completely seals the front from the back. I personally used hot glue. I used a speaker from an old pair of headphones with a broken cord. If you do this as well, you should be careful not to break it. I learned it the hard way using my screwdriver as a lever. If you want a good sound insulation, you'll want to seal back the earcup (with e.g. hot glue). You can then reassemble the whole thing and enjoy your headset. These headphones are not stereo, as-is they only have a single audio channel on the connector that is sent to both earcups. This perfectly makes sense since they were designed to work with vehicle radios. EDIT: These headphones can however be adapted to become stereo. You can find out to procedure here. 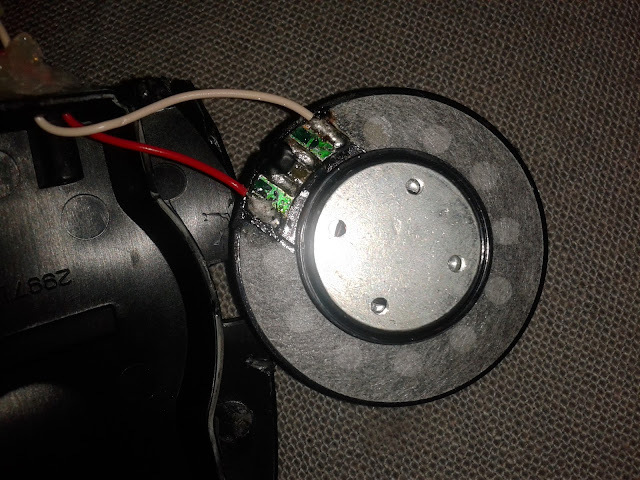 Headphone speakers are not serviceable ! The cup is glued and you cannot take them apart to swap the speaker with a working one (the same goes for the microphones).